Kahlil Gibran-poet, philosopher, and artist-was born in Lebanon in 1883 but spent his final twenty years of life living in the United States. The three books that compose this audiobook are collections of Gibran's aphorisms, parables, and poetic essays. 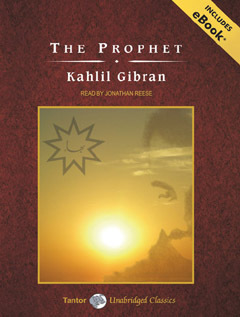 The first book, The Prophet, was originally published in 1923 and is considered Gibran's masterpiece. It is written in prose poetry in twenty-eight parts, and deals with such topics as love, freedom, good and evil, religion, and death. It is a mystical and intensely subjective work, presenting the human soul as essentially noble and good. In The Forerunner, originally published in 1920, Gibran asserts that 'nobody is to be blamed for our 'being' and 'having' but ourselves.' Gibran makes it clear that we are our own destiny and not the toy of a blind fate. Finally, the titular entity of The Madman, originally published in 1918, is not literally mentally unbalanced; on the contrary, he is perfectly healthy. His madness is only in the eyes of others. Gibran asserts that we tend to be what society expects from us, even though these expectations could be detrimental for the development of our self-identity. Oftentimes, we veil our true selves with masks out of fear of being ridiculed by others.